If you want to get into affiliate marketing, one of the first companies you might consider joining is the Amazon Associates Affiliate Program. But, before you rush over and click apply, make sure you understand the ins and outs of the program. If you are blogging, chances are you want to make money. While there are ad networks, sponsored posts and selling your own products, one of the easiest ways you can make money is through affiliate marketing. 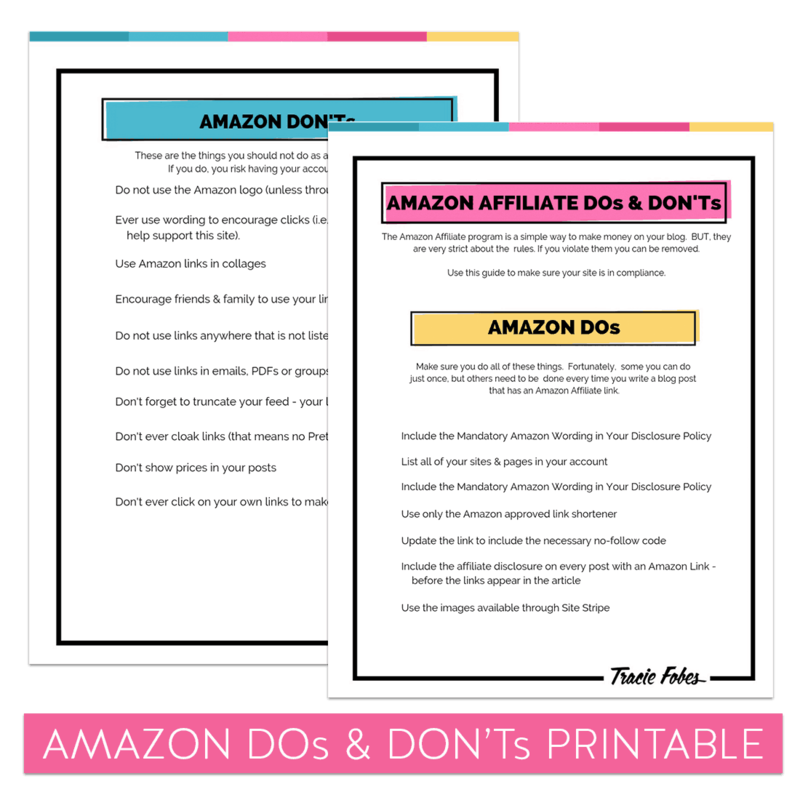 And, when it comes to affiliate partners, one of those most bloggers will start with is Amazon. Amazon is one of the simplest affiliate programs to join and use on your site. People know and trust the brand, so you don’t have to do much to get them interested. But, there is more to it than just adding a link. You have to know how to get started but more importantly, know exactly what mistake you don’t want to make as you can get kicked out as well! 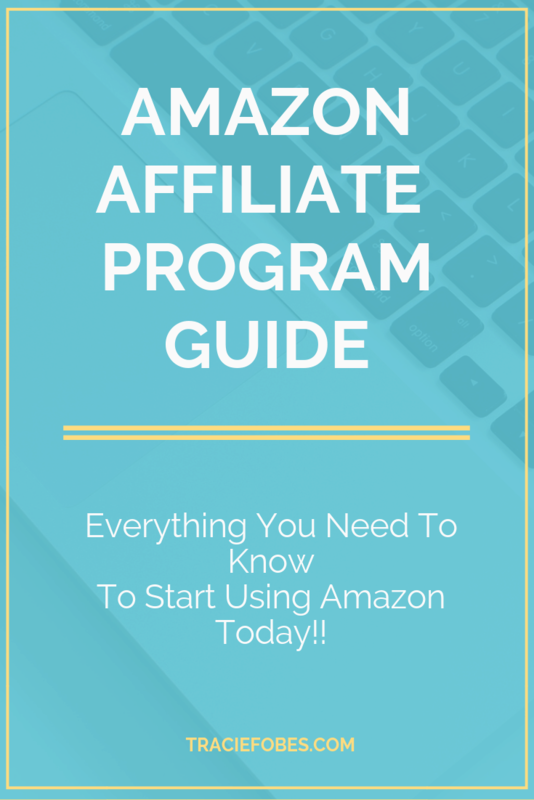 WHY SHOULD I BE AN AMAZON AFFILIATE? HOW DO I GET STARTED WITH AMAZON? WHAT DO YOU SAY IN YOUR DISCLOSURE STATEMENT? HOW DO I ADD A DISCLOSURE STATEMENT TO MY ARTICLES? WHAT WILL GET YOU KICKED OUT OF THE AMAZON PROGRAM? You can read through the entire post or just skip ahead to each section to learn more! If you have ever visited a website, you may have seen products or services are linked. You may have even clicked on the link to learn more and purchased the recommended product. When you did that, the site that sent you there just made money. Affiliate marketing is when bloggers get trackable links they place on their site. When readers click and buy or sign up by clicking on that link, you make money. Almost anyone who has a connection to the Internet knows who Amazon is. It is a trusted brand and shoppers know they can get just about anything they need on their site. Add in the fact that millions have an Amazon Prime account and it makes promoting it very, very easy. It takes just a few minutes to get started with Amazon. Visit the Amazon Associates login page and click join for free! If you already have an Amazon prime account, log in with those credentials (as it will make it easier to make links – which I will explain below). Follow the steps to create your account. You will also want to bookmark this page so you always know where to find the Amazon affiliate login. It is important you complete every item correctly. Make sure you link both your website and the social media accounts you will use to promote their links. Do not leave anything out. You want to ensure you are honest when completing your application. Once you are signed up, you are in the program! But, before you rush in and make those links, there are a few other things you need to make sure you take care. There are legal disclosures you must have on your site, such as your privacy and disclosure policies. If you do not have these, Amazon can – and will – remove you from their program. Don’t risk it. If you do not have either of these policies, you should purchase one as soon as possible. Do not do a Google search for a free version. It is imperative that your website complies and using a free one does not guarantee that. Instead, purchase one through a licensed attorney, so you know you are following the law. If you do not have this wording on your site, Amazon can – and will – remove you from their program. They do not mess around. Open your disclosure policy and simply add this phrase “As an Amazon Associate, I earn from qualifying purchases.” That’s all you need to do! Now, your disclosure policy satisfies the Amazon requirements. But, you aren’t done quite yet. When you set up your account, you will need to make sure you let them know everywhere you will be using the links. This should include your social accounts as well as your website(s). When you are logged into your Amazon Associates account, click on your name at the top and from the dropdown, select Account Settings. Then, under the next menu select Edit Your Website and Mobile App list. Enter all of the pages and sites you will be using to promote your site. That’s all you need to do! The Federal Trade Commission (FTC) requires you disclose your relationship with any brands. They also mandate that this must be done on a website before sharing any links that will direct readers to that partner. Don’t make any mistakes when putting your disclosure policy on your site. You want to do it right, from the beginning. Can’t I just put this in my footer? No. You can’t. The reason is that you cannot force readers to have to search for the disclosed relationship. You must be upfront with them. The only way to do that is to put it in the post. I don’t like it at the top, so I am putting it at the bottom of my post, is that OK? Nope! The FTC is clear that the relationship must be disclosed before the reader sees any links. That means putting it at the bottom means they are not seeing it until after they click. I am just putting the Amazon wording in my sidebar so I am covered, right? Again, no. You are not. The reader would need to go looking for that disclosure. The only way to do this is by putting in your disclosure policy. Do I need to link to my disclosure policy on the post? Yep! You must give readers a direct link to your full disclosure policy. And, it must be on any post that has an affiliate link in it – even if just one single link. You have to be honest in your disclosure statement. You just need to tell people that you have these links on your site and that they can read your policy to learn more. It does not need to be cute or tell them too much. In fact, if you are with Amazon, you can’t say too much. Amazon does not allow you to do anything to encourage clicks. Saying things such as “clicking on my links helps support this site” is not allowed. That is like asking them to click to support you. It must be very cut and dry. Keep your disclosure statement short, sweet and to the point. It can be as simple as “There are affiliate links in this post. Read my disclosure policy to learn more.” Then, include the link to your policy. Readers have no idea what “affiliate” means. Therefore, you need to direct them to your policy where you explain this so they can understand. You can’t leave it vague and unclear in any way. When it comes to placing the disclosure statement in your blog posts, there are a few options available. Any will work it is up to you use the one that makes the most sense. You can add your disclosure statement on each post that has affiliate links. The downside to this method is that you have to remember to do it each time your post has links in it. In addition, you never want to put this at the very top of your posts as that can interfere with SEO. Since Google crawls your page from the top, it looks there for keywords. You do not want your disclosure policy to be what they crawl. If you use this method, add the disclosure between your introductory paragraph (do not put any links in it), but before the rest of the article where you will have links. If you would rather have the statement added without having to remember it, a plugin might be the answer. One that you can download and use for free is the FMTC plugin. You can link to your disclosure policy and it will be added to the top of every post, without needing to remember to do so. If you don’t like using plugins, then this may not be the right option for you. Fortunately, this is a light plugin that will not have any adverse effects on your site, so you can use it with confidence. While both of the above work very well, the best way to add your disclosure is to code it into your site. Since every theme varies, you will need to research how to add it to yours. If you are not confident enough to do this yourself, considering hiring someone to do it for you. Once your account is set up, and the legal disclosures are in place, it is time to get busy linking! There are a couple of ways you can get a link. 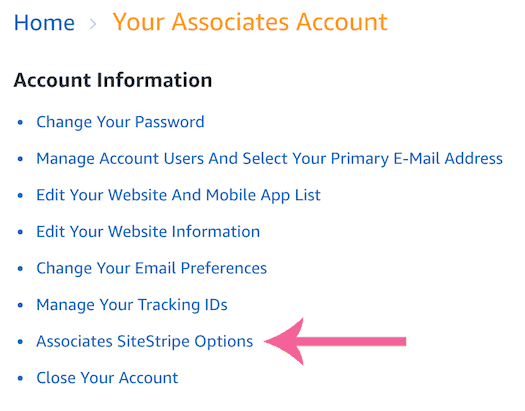 You can use either the Site Stripe or create a link on the Amazon Associates page. 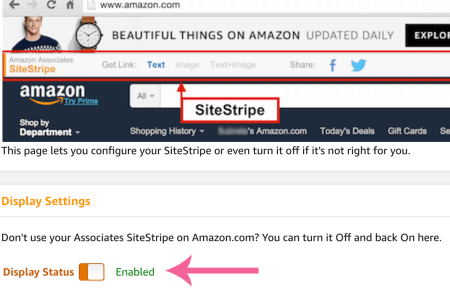 The simplest way to make an Amazon link is to use the stripe feature. You enable this in your Amazon Associates account and then log into Amazon with the same credentials you use for your affiliate account. When you are on any page on Amazon, you can click a couple of buttons and have a deep link to use right away. First thing’s first. Let’s make sure you have stripe enabled. 1. Log into Amazon Associates. 2. 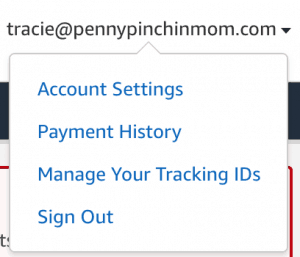 Select the down arrow next to your account name at the top of the page and select Account Settings. 4. Click to Enable and check to ensure you have the social and get link buttons checked. You can now start to use stripe on Amazon! Let’s go through that now for you! Log into Amazon like you normally do, but make sure that the credentials you use are the same as you did when you created your associates account (which may be different than what you use for Amazon Prime). Find the product you want to promote on your site. It can anything you like. Once you find it, just click on the Text or Image link at the top of the page. Copy this link and toggle to your site. Highlight the text you want to be linked. Click on your add a link button and then paste this link in. One of the things many people do not realize is that you can’t just copy any Amazon image and use it on your site (see below under things you can do to get kicked out of Amazon). But, there is still a way to add an image to your post and stay in Amazon’s good graces! Use the stripe to get the image you need for your post! Find the product you want to promote. From the stripe bar, click on image. From here, determine the image size you need to use. In most cases, it will be small or medium, but you may need to experiment with your site to determine the right size based on your theme. Now the image will be on your site!! There may be times when Amazon does not let you link to a product, or when you want to link to a search result rather than a product. You may not be able to use stripe for these links. You will need to make them through the associates platform. Log into your Amazon associates account and then Product Linking. Scroll down to Link to Any Page. You will get the links in the same way as you did through stripe and will add them to your content in the same fashion. You want to rank in Google, so you have to abide by their terms. When you link to any site, you are signaling Google that this site has authority and they should rank for that term. But, when money exchanges hands (or has the potential to make money), then you can’t give them link juice as that is like buying placement. This is where no-follow comes in (read more about using no-follow links). Since you have the potential to make money on your Amazon posts, you really need to use the no-follow link. That will tell Google that you don’t want to pass along authority to Amazon. Now, the thing with Amazon is that while Google says that is the case on affiliates, they are also smart enough to know what Amazon links are and usually ignores them anyhow. That does not mean you can overlook adding a no-follow link. It just says if you happen to forget, do not stress about it. Google is pretty smart and figures these things out. So, how do you add the no-follow code to an Amazon link? The way you do it depends upon the type of link you are grabbing from Amazon. Look at the red in the code and you will see that the no follow code has been added to the link. Having the proper disclosures and using the right content is just one thing that is required to be a part of the Amazon affiliate program. There are mistakes countless bloggers make that result in removal from the program. 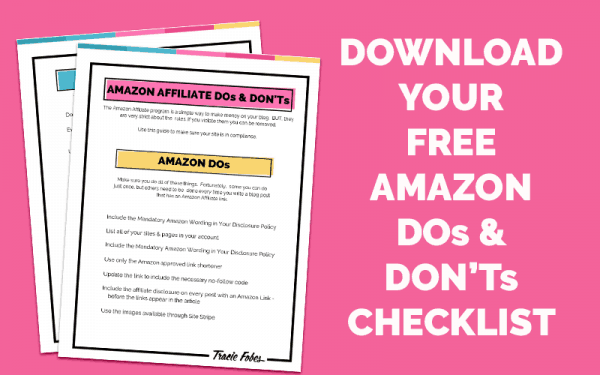 You certainly do not want to put in the hard work to add Amazon links to your blog posts to get an email to let you know that you are no longer a member. Keep these things in mind, and you’ll keep Amazon happy while making money. You may be tempted to add an Amazon link to your email newsletter, ebook, course or free opt-in on your site. Don’t do it. Amazon requires that all links be crawlable. They can’t crawl them in these formats. Therefore, they are not allowed. Even if you add the necessary disclosure, you still cannot do this. Just don’t place your links in any of these formats and you will be OK. There are still some people who use an RSS feed reader to follow websites. And, some bloggers even use these to send emails to their readers. Having a link that shows here is also against the Amazon terms of service. Therefore, make sure that any feed that goes out from your site includes only an excerpt and it not the entire post so that your Amazon link is not showing where it should not. Once again, Amazon has to be able to crawl links easily. Placing them behind a screen, such as approval into a group, means they can’t get access to them. Amazon changes prices all of the time. They may even change multiple times a day. Therefore, they do not allow prices to be placed in blog posts as they do not want readers to click to find a different price. Most readers do not care that about seeing a price in the article or blog post, so don’t stress about not including it. If you want to show the price, then you will need to use the proper widget from the Site Stripe so that it dynamically updates the price. You might have a great article about the best farmhouse signs you can find on Amazon. That is great. But, you can’t use those images in any way other than grabbing the link from Amazon (see above). Don’t copy images for the products you want to promote and use them to make a pinnable collage or image. If you absolutely want to do this, you must reach out to each seller and ask for permission to use their image (keep those emails for reference). This can be time-consuming and you may not get a response so you still can’t use them. Instead, create an image that works for your post that you either take yourself or purchase from a reputable stock image website. There is a reason this was one of the first things discussed. It is that important. You absolutely must have the Amazon wording on your website and disclose your relationship. Also, you absolutely cannot use any wording in your statement that encourages people to click. Phrases such “as support my site” or “help me share content with you” can get you quickly removed from the program. Amazon wants to ensure you are a valid partner. That means you must make sales. If you do not have three sales within 180 days after signing up, they will remove you. But, the good news is that you can reapply again and have more than one chance to make a sale. You can’t get a commission on your links. Mistakes can happen, and Amazon realizes that. However, continually buying through your links can result in removal from the program. Before you buy, find another site you can click on to start the cookie for them or use a clean browser, so there is no tracking attached when you shop. It is important you use your affiliate links only on the platforms in your account. That includes your website and social media accounts. You can’t use your links anywhere that is not listed. If you happen to start another website, you can use the same links on the new one. Just make sure you log into your account and add the second site’s details to the list of websites and links you will use to promote their content. Affiliate marketing is a simple way to make passive income on your site – even while you sleep. Amazon is just one of many programs available. There are many ways to promote the products and services you love so you can make money. This article just scratched the surface of affiliate marketing. To make a difference on your site, you want to use the right partners that work for you. Affiliate Blogging Roadmap walks you through the process of getting started with affiliate marketing. It helps you identify the right partners and all of the legal issues surrounding affiliate marketing. 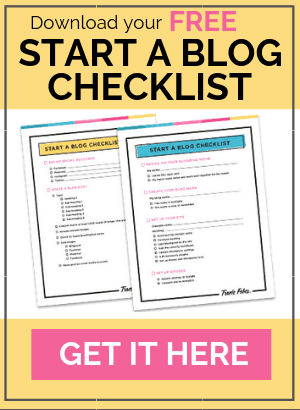 Best of all, you will learn simple strategies to implement in your blog posts and newsletters to get more sales and conversions. Affiliate marketing is a simple way to make money. I am so glad to hear that! Amazon can be a tricky best to conquer! Tracie, this is great! I’m going to share it with my friend who needs help with Amazon. Thank you! So clear to understand. 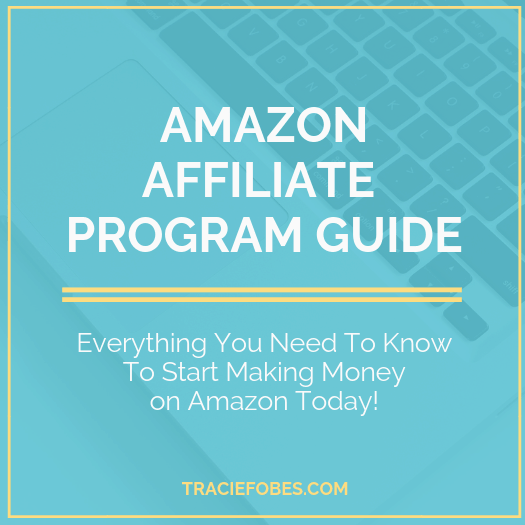 I’ve been looking for Amazon affiliate marketing explained in a way that made sense to me, and this did the trick. I am so happy to hear that! There is so much to using Amazon that it can be overwhelming.